Purpose, Story, and Style . . .
From the moment Lilia told me about her proposal for Hopa Tropa I was ecstatic and dying to be a part of it. During the audition process I had to present a monologue and a song, the standard for musical theatre performers. As a musical theatre performer I am very comfortable with dance and have training in many areas; However, the dance audition was the scariest and most challenging part of the audition process. It was there that I met Ivan. This 6 foot Bulgarian choreographer exudes strength, power, and insanity. The dance styles he engaged us in were fun, aerobic, and unique. The Bulgarian culture’s dance and music is the antithesis of any training and methodology I have ever experienced as an American actor. The body position and weight distribution are grounded and syncopated on the soft beats, while all of my ballet training has involved being lifted and light with the body and its weight distribution. I have had to reteach my ear, my feet, my hands, and my heart to listen to these wonderful Bulgarian tempos, rhythms, and melodies that are almost invisible to the American ear and foot. I have had the time of my life learning many new dances from different regions of Bulgaria, each with their own purpose, story, and style. Ivan is not one to teach in the typical classical training in front of a mirror breaking down each step, each foot movement, each arm position, but instead has engaged us in a positive, constructive sink or swim experience. He has thrown us right into the mix and told us to have fun and look like we are having fun and the steps will just come to us. We took dance classes with him and several folk dancers from Siberia, Spain, Bulgaria, and many other nations. These women in his class literally opened their arms to us, sometimes physically carrying us through the steps until we got it right or smiled and laughed the entire way through, attempting to grasp at least one element of the choreography. I’ll never forget walking into our first rehearsal and feeling like I’d set foot in Bulgaria. The room was full of beautiful traditional objects, alternately simple and intricate, all of them expertly crafted and entirely alluring. From spindles to swap hooks, earthen jugs to hollow gourds, we one by one made our acquaintances in both English and Bulgarian – a language both exotic and intriguing, however initially impossible to understand. With Lilia Slavova’s expertise and grace guiding us along, and Ivan Dimitrov’s energetic and contagious gusto, we followed Julia Tsheva’s skilled hands as she made each object, one by one, come to life. A spindle and a pair of wooden spoons became a mosquito. A copper pan and woven apron became a cow. Back dropped by Antionio Petrov’s vibrant set, belted in colorful costumes, and stumbling over our first Bulgarian words, we began to create. I felt so happy and charged in a way I haven’t felt in a long time. This was much more than a standard first rehearsal. It was a magical amalgamation of people, places, and ideas coming together to celebrate the folk lore and practices of an amazing culture. All with the intention of gathering games, stories, and puppets to create a show for children, whether Bulgarian or not. And truth be told, the excitement in the room among everyone – to share, to learn, and to play – made us all like children. Uninhibited and unprejudiced, we went wild over the traditional games, we took fastidious notes on new words and songs, and we spent hours playing with the folk objects, discovering endless ways to bring them to life. Like children, we were sponges – both the actors and the directors shared observations and learned similarities between the American and Bulgarian cultures that were thrilling in their freshness or fascinating in their familiarity. And through it all, everyone had a lot of fun. From the first day I felt deeply that this is more than a standard show. It is what theatre is at its best – a moveable work of art that breathes and thrives upon those involved in its performance and those participating in its audience. It’s a fantastic exchange of positive energies and open minds. I can’t imagine a better way to learn about a culture, or to connect with the world. It all happened really over night! I was given the chance to be part of the Euro Kids Festival and most important to do it in Ambassador Theatre. I went….crazy! I was so excided about that opportunity that in a few seconds I decided everything about the show. It seems I have been waiting for that chance! I knew what I wanted to direct, the idea was born in a few seconds, the name even faster. What is more stimulating than the chance to introduce your own culture to American audiences, and even more to American children? I have been directing shows from all over the world, but now I was given the chance to show the folklore side of my own culture. I used to dance in a children’s folklore group, sing in a children’s chorus in my country, and I studied puppetry in the Institute of Dramatic Arts. This, plus my years of teaching kids (30! ), all put together made sense to me. The idea to also have American actors doing it was uplifting! Dances, songs, games, sounds, traditions, rituals, and colorful costumes plus authentic objects that are part of our near past; all of that material inspired me to write a play with almost no words. For me the images are enough to tell a simple story! I want the show to cheer our patrons, to take them on a journey to my beautiful country-Bulgaria. The best way to educate children is through playing, that’s how they learn the best and retain knowledge the longest. Let’s take our children on a short trip to a lovely little country where the traditions are still alive! I am one lucky, lucky director! I have the best actors, whose enthusiasm and creativity inspire me to work even harder. I am also lucky, because the people working on this show with me are not only some of the best in this business, but they all are my dear friends as well! 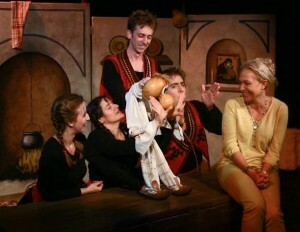 Come and enjoy a taste of Bulgarian culture! As we begin to move through this summer and finish the run of our inaugural production, our thoughts are immediately moving onto our exciting projects for the fall and winter. “Hopa Tropa” is just one of our upcoming creative projects that will bring a colorful taste of Bulgarian culture to the DC area. “Hopa Tropa” began as an idea to continue with Ambassador Theater’s mission to highlight international cultures and bring them to the DC area. After working with Polish theater, we enthusiatically moved to working on Bulgaria. 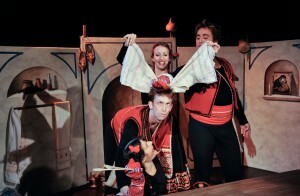 And what better way to bring the color, fun, and excitment of Bulgarian culture, than through a children’s show! We began searching for a piece to work on, going so far as to contact artists at famous children’s theater in Varna, Bulgaria, who informed us that the particular piece we were interested in was created experiementally through improvisation, and no written draft was available. Brainstorming on what next to do, we decided to write our own piece, dubbed by Lilia Slavova “Hopa Tropa!”, after a spirited jump in a dance. With this kind of spirited spontaneity, “Hopa Tropa” was born.